What are the planning and community development implications of live-work? They are legion, and some are not what they first appear to be. All are treated in detail in my book Live-Work Planning and Design: Zero-Commute Housing, (Wiley, 2012). 1. First, live-work is not a monolithic phenomenon. Some of what bears the name is predominantly residential in character. The rise of the Internet, telecommuting, and teleconferencing have created unprecedented opportunities for home office and small, at-home business, which we (and many jurisdictions) call home occupation. On the other hand, there is a demand for a more work-driven type of space in which employees and walk-in trade are permitted and more intense and/or more hazardous kinds of work are performed. This we are calling work/live. 2. There is a demonstrated tendency for live-work space to revert to purely residential use, regardless of how it was permitted or represented. This tendency is most pronounced in new construction condominiums or “lifestyle lofts.” In some locations this is tolerable, in others it can cause harm. Because it is intended to be a flexible type, it is fair to say that work will occur in a live-work unit at some time, but that work activity may not always be present. 4. Residential reversion, described in #2 above, should be discouraged strenuously in those areas where pure residential use is undesirable due to incompatibilities with other pre-existing uses, lack of residential amenities, etc. Residential reversion can be slowed down, if not entirely stopped, through the use of a combination of regulations, sanctions, financial incentives, tax policy incentives and, perhaps most importantly, the design of units for the appropriate level of proximity between living and working spaces. Residential reversion as a central issue of concern was an important part of a study conducted in 1997 by TDA and others, entitled Work/Live in Vancouver. 6. There is, however, a place for lifestyle lofts, especially as part of a lively mixed-use district, often transitioning (spatially) between residential and commercial/industrial areas, between downtown commercial and industrial neighborhoods, or generally on residential neighborhood edges. Lofts are often an appropriate reuse of historic structures which might otherwise remain vacant, and in fact, relaxation of building code requirements for all kinds of live-work is permitted under state law in California. 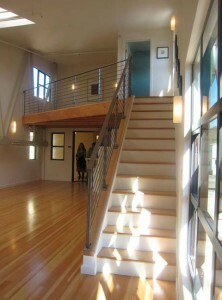 The permitting process for lofts, particularly in the case of new construction live-work, should be closer in character to residential regulations, which means instituting design review, open space requirements, inclusionary zoning, and (in California) full imposition of school impact fees. 7. Artists began the live-work phenomenon, and they require a kind of affordable space that can (almost) only be found in older industrial buildings. In areas with hot real estate markets (or where lifestyle lofts are already out of control, which includes many cities), the only way many artists can retain control of their spaces is through ownership, long-term rent subsidies, or the creation — and enforcement — of “Artists’ Protection Zones” providing long-term affordable live-work. It is, in fact, more of a financial problem than a coding problem, although certain planning measures can help (such as designating certain live-work areas as rental only in existing buildings only). Artists contribute significantly to cities’ economies (in San Francisco, 1 in 11 jobs are in the arts sector). They are the keepers of our culture, and they deserve our support and protection. 8. Live-work plays an important part in The Incubator Cycle. Ideas for small businesses often progress through different work spaces, from a spare room at home, to the garage (of Apple Computer and Hewlett Packard fable and fame), and often next to a live-work space. In fact, for some, the progression from home occupation to live/work to work/live space is part of the cycle. Government and corporate-sponsored incubators are a valuable newcomer on the scene: many have been very successful. A project idea that should be considered is a “Live-work Incubator,” in which business assistance and facilities would be provided in a residential — i.e. live-work — setting. Such an incubator could combine well with a coworking space. By locating live-work projects in pedestrian-oriented neighborhoods, on lively mixed-use streets (sometimes above shops) where there are easy opportunities for one to step outside and encounter others in a congenial public realm. Many New Urbanist projects include live-work spaces; as mentioned above, the fit is a natural. The apartment above the mom-and-pop store, or the country lawyer whose cottage is behind his office are time-honored built forms in the traditional American town. They are both forms of live-work. Live-work is arguably the most viable form of market rate development in many inner cities. It is the only building type that provides both employment and housing. A common term on the lips of planners today is “live-work-play environment.” Inherently mixed use, infill live-work projects or renovations of existing buildings often go a long way toward meeting many of the goals of The New Urbanism, and therefore could be seen as one of its best entrees into an inner city context.